Clusters of unripe grapes are appearing in local specialty markets. Those beautiful greens at the top are grape leaves. Details on how to preserve grape leaves are in Zing! By Gorji Cookbook. Unripe grapes, also known as sour grapes are showing up in the markets. When I was a kid, this is the time of year we made unripe grape juice, also known as Verjuice and stored it in the cellar for use throughout the year. A sauce made with it goes very nicely with Salmon and other fishes. 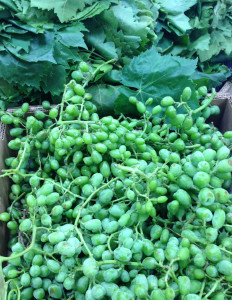 Unripe Grapes, so vibrant, so packed with flavor! This time we are serving them with Copper River Salmon. Fresh unripe grapes add zing to sauces that go well with fish. Last year when they were in the markets we served them with Wild Caught Quinalt River Sturgeon with fava beans, unripe grapes and dill basmati rice. 7 Replies to "Unripe Grapes (Verjuice) Add Zing! To Sauces & Fish"
I had no idea unripe grapes could be used in cooking. What type/variety of grape is normally used for this? You can basically use all kinds of grapes from all vines when they are green, but make sure & wash them before use. Very interesting, I would love to experience what the blend of flavors made with the unripe grapes. I bet it taste heavenly as does everything the Chef creates! I would be more than happy to provide some foer you if you can’t find them.